Anthem MRX 700 review | What Hi-Fi? What do you think is important in a high-end multichannel amp? If your answer is sound quality above all else, then Anthem’s new MRX 700 deserves your full attention. This unassuming amp doesn’t appear to be anything special. Certainly, rivals from the likes of Onkyo and Yamaha are considerably more imposing to look at, not to mention far more feature-packed. There are four HDMI inputs and a single output – enough for most systems but well behind most rivals. It would be nice to have a mutlichannel analogue input and the ability to stream music from a NAS drive over a home network too. Every rival we’ve reviewed has internal processing that can compute full speaker set-up and room equalisation. The MRX 700 doesn’t. You’ll need a PC to run the software, though the company provides a high-quality microphone and stand with the product. Sounds like hassle? Perhaps, but not for you; Anthem encourages its dealers to install the product. We suggest if the one you go to doesn’t seem keen to help, take your business elsewhere. Once set up, the room EQ is immensely flexible and works well. Even so, our test rooms are relatively well-behaved, so we preferred the sound with the equalisation function off – but we can see it being very useful in less helpful surroundings. 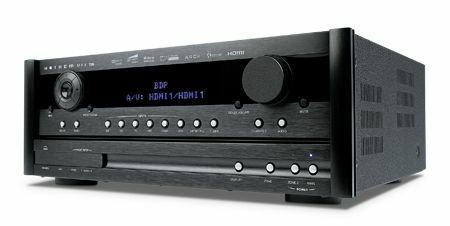 Multichannel amplifiers rarely look stylish, but even by the category’s relatively low standards the MRX 700 is no looker. There’s a generous littering of buttons on the front panel and very little concession to appearance. Still, let’s call it functional-looking and get on to performance. This is the area in which the MRX 700 makes its claim for greatness. Whatever the input you choose, it’s a fast and agile listen. Feed it a surround music mix such as Michael Jackson’s This Is It and the amplifier bounds along with enthusiasm and plenty of drive. There’s a precision with which it defines the leading edges of notes that makes almost all rivals bar the Pioneer SC-LX85 sound ponderous. The Anthem even does a decent job with rhythms, delivering a surefooted sound secured with well-structured timing. A surprisingly realistic rated power output of 7 x 76 watts is way behind that claimed by the competition, but the MRX 700 lacks nothing for punch. Its slightly lean presentation might not quite be the last word as far as authority is concerned, but feed it something dynamically challenging such as our old favourite The Dark Knight, and it renders explosions and huge dynamic shifts with ease. There’s a no-nonsense way about the way this amp delivers sound that is as likeable as it is rare. We’re impressed by the Anthem’s ability to track sounds between the speaker channels, too – effects are panned with confidence and pinpoint precision. All in all this is a terrific performance for the money. On paper the Anthem MRX 700 might not seem a particularly strong contender, but judged on sound it has little to fear from anything near this price.